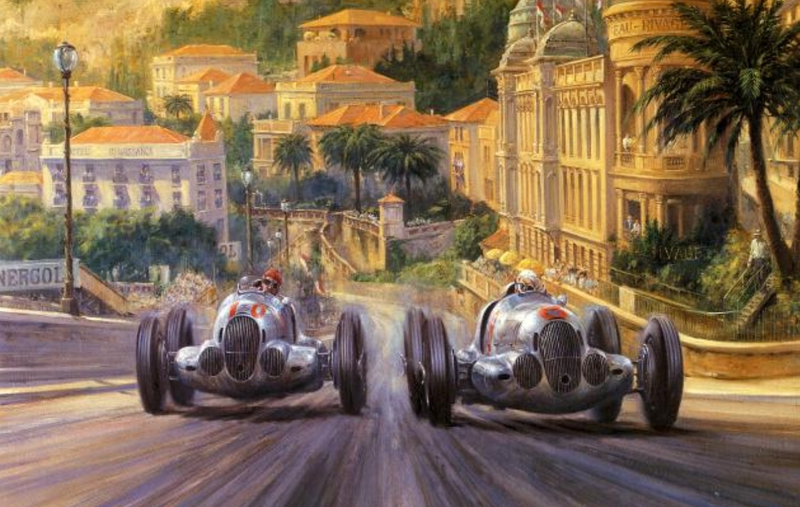 This image is Alan Fearnley’s ‘Battle of Beau Rivage’ from his book ‘The Classic Car Paintings’ and ‘depicts a dramatic battle amidst the architectural wonderment of the principality pre-war’, von Brauchitsch won the race against team orders. Caratch won the European title in 1937, both he and Bernd Rosemeyer, Auto Union mounted, won 4 races apiece but Rudi had the larger points haul. Manfred’s nickname was ‘The Unlucky Bird’, when he had this chance for a race victory he was not going to let it slip away. He said later in life that Alfred Neubauer, Mercedes famous team manager did not have much to do with him afterwards for the rest of his career. It was one of the few races Caracciola lost to another Mercedes that year. The Mercedes W125 was Fearnley’s favourite machine ‘it seems to embody all the visual impact that a Grand Prix car should have’, his painting is a superb, dramatic work.